VIBRATING SANDER - 9" X 4 1/2"
This lightweight vibratory hand sander is ideal for light duty sanding of drywall and woodworking projects as it allows you to get flush into corners. Paper gripping clips are on either end, allowing for quick install and removal of sandpaper. This machine uses half sheets of sandpaper, and we sell a variety of grits from 60G to 150G in-store. 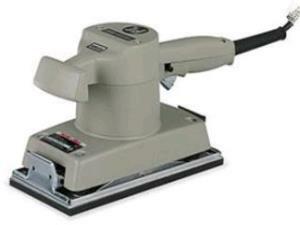 * Please call us for any questions on our vibrating sander 9 inch x 4 1/2 inch rentals in Hillsdale and Ridgewood NJ.